Coastal Club Lewes Delaware Beach House For Rent by Delaware Beach Home Rentals in Lewes Delaware. Winner of The Community of the Year Award (Sussex County AND The State of Delaware)! This is TRULY A SPECIAL PLACE to spend a vacation! 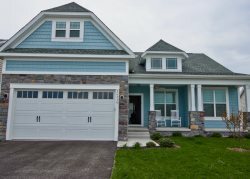 The BRAND NEW 5BR house at Coastal Club resort has 5 BR, 3 MBR suites, 4 full baths and sleeps up to 12 including the queen sleeper sofa and has more than 4,200 square feet of living space.. The gourmet kitchen features new stainless steel appliances, granite countertops, dishwasher, disposal, through the door ice maker and water and natural gas stove and oven. Oversized Screened in Porch looks out over your wooded back yard w park-like views. There are large HDTVs (one in the family room and one downstairs in the entertainment room) and XFinity cable TV and wifi internet service with WIFI throughout the home (Comcast's version of FIOS). The home features 10 foot ceilings and a spacious open and airy floor-plan. The amenities include a several pools including a water park with large water slide and pirate boat fountains and an adult infinity pool, tennis courts, pickle ball, fitness gym, restaurant, swim-up bar, clubhouse and more. New for 2019 - a wonderful indoor pool w lap lanes and an incredible HOT TUB!! You’ll also love strolling along the 3 miles of wooded walking trails. 5 Bedrooms including 3 master bedroom suites. Brand New Premium Mattresses throughout. Extra Large HDTVs including 1 in the family room and downstairs in the Entertainment Room. RECREATIONAL PASSES: Recreational Passes are needed to utilize the resort amenities. You don't have to purchase any passes if you don't want to - purchase only for those who'll be using the amenities. Passes are purchased at an additional cost after you arrive. The cost in 2017 was $12 for single day pass per person or $40 per weekly pass per person . Children under 12 don't need a pass - they just have to be accompanied by an adult who does have a pass. LINENS: We will supply mattress pads, pillows, blankets and comforters and you should plan to provide your own sheets, pillow cases and towels . You'll have your own washer and dryer inside the home that you are welcome to use. If you need to rent linens, we have provided the name, phone, email and website to order and rent linens in our rental agreement for Sheets At The Beach located just about 2 miles away from the home - they also deliver linens to the home. We are the exclusive agents for this home. We can answer any questions you have, either by phone or by email, and we can put together a rental reservation to lock the home for you for the dates that you are requesting. COASTAL CLUB RESORT: Imagine vacationing in a community so rich with amenities that you never want to leave! Located just moments from downtown Lewes, Coastal Club is an extraordinary resort destination, situated around a spacious nature preserve with a peaceful pond, bordered by rolling woods. Begin your day enjoying the sights and sounds of nature along the three-mile Eagle view trail. Enjoy a game of tennis or bocce ball with family and friends. Grab a cup of coffee at the Lighthouse Club, then take a dip in the incredible infinity pool and enjoy a cocktail at the only swim-up pool bar in Delaware. No matter what you’re looking for in a resort community, it’s all right there at Coastal Club! COASTAL CLUB WAS THE RECENT WINNER: COMMUNITY OF THE YEAR AWARD FOR SUSSEX COUNTY & THE STATE OF DELAWARE! !